The famed inventor's guest appearance is certain to make this Thanksgiving episode electric. This season of The Big Bang Theory is certainly shaping up to be filled with some amazing guest stars! Earlier this week, we revealed that Wil Wheaton and the son of Mr. Spock, Adam Nimoy, would both be making an appearance on an upcoming episode ("The Spock Resonance"). And now we can exclusively tell fans that Tesla founder Elon Musk will also appear. The real-life engineer will make a brief appearance in the show's Thanksgiving episode, which will air on Thursday, Nov. 26 at 8/7c. He'll be playing himself and is expected to have an interesting interaction with Howard at a local soup kitchen. 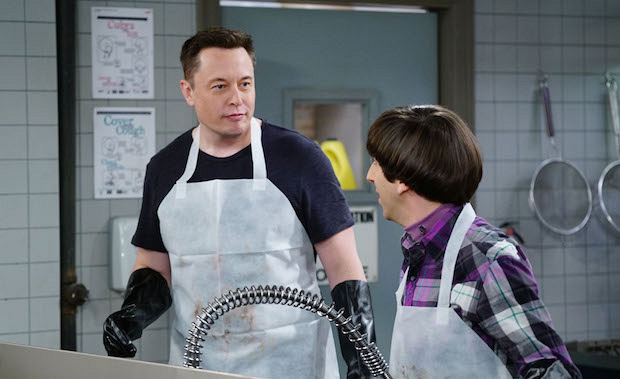 Though this is Musk's first physical cameo on The Big Bang Theory, the SpaceX founder was a topic of conversation between Amy and Sheldon during "The Septum Deviation," Episode 9 in Season 8. Plus if you look closely at the walls in Sheldon and Leonard's apartment, you can see a black-and-white photo of a Tesla hanging up. As you gear up for your Thanksgiving feast, starting Nov. 5, don't forget to watch all-new episodes of The Big Bang Theory on its new day and time, Thursdays at 8/7c.